Efforts from the government and the Department of Agriculture, in particular, have sparked renewed interest in agriculture, to the point that people would leave their current jobs and pursue full-time farming. If this boost in agriculture keeps up, DA can make their mission a reality - to help and empower the farming and fishing communities and the private sector to produce enough, accessible, and affordable food for every Filipino and a decent income for all. In terms of farming, one way of making this mission possible is for DA to provide the facilities which the farmers need to make them more productive. 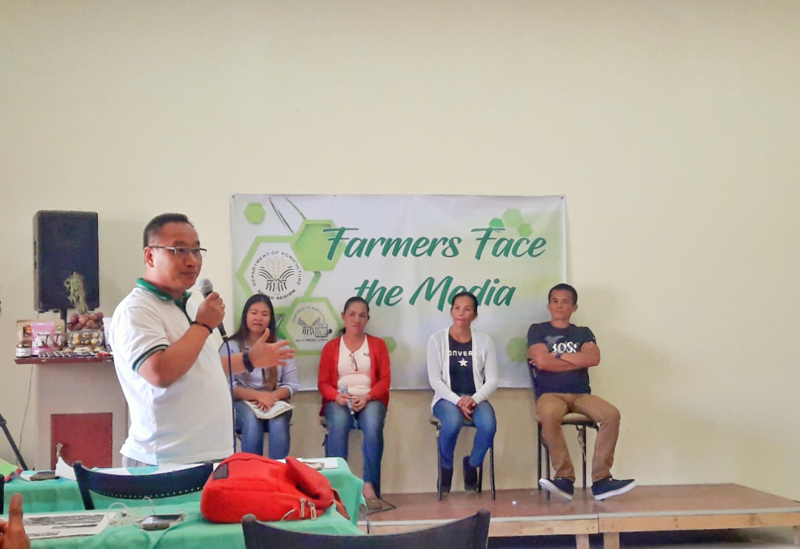 Farmers of various commodities shared their experiences on how DA-XI helped them succeed in ‘Farmers Face the Media’, an event spearheaded by the Regional Agriculture and Fisheries Information Section (RAFIS) of DA-XI. Panelists include Joycedel Macias, Marites Arellano, Lupe Calunsag, and Teresa Calunsag. Joycedel Macias is a chocolate researcher from Biao Agrarian Reform Beneficiaries Cooperative (BARBCO), which aims to help local farmers gain access to affrordable and high-quality planting materials. They also have chocolate products under the brand of Chocolate de Biao, which comes with a unique marketing strategy to capture the interest of the millennial market - adding ‘hugot lines’ to its packaging. She verified that DA-XI provides efficient assistance to farmers and associations - provided that the farmers prove that they are also worthy recepients of the facilities. Macias said that DA gave assistance in building their nursery, and also assisted in the upgrading of their facilities, such as the solar dryer and fermentation facility. The most recent addition for their processing is a two-story building which serves as a stockroom for their cacao. Marites Arellano represented Balutakay Coffee Farmers Association (BACOFA) which is located in Sitio Pluto Balutakay Bansalan, Davao del Sur. BACOFA produces specialty coffee which had been graded 85 over 100 last year by the International Q1 Cup Grader during the 2nd National Coffee Conference in Baguio City. Arellano said that DA-XI is equally supportive of the coffee industry. She stated that personnel from the government came to their area to assess their needs and provided the necessary facilities such as a roasting machine and a solar dryer, which they have also upgraded. Now, a storage facility for their coffee beans is also being planned. She also thanked DA-XI for helping the coffee farmers, but the vegetable farmers as well by providing free fertilizer and planting materials. Lupe and Teresa Calunsag of the Matanao Bulb Onion Farmers Association (MABUFA) are well-known onion farmers of Asinan, Matanao, Davao del Sur. Even though it’s believed that bulb onions aren’t compatible with the weather and soil type in Mindanao, Mr. Calunsag has successfully cultivated this crop. Aside from onion, he also has pechay and eggplant in his farm. He is grateful to DA-XI for providing them with their onion starter kit in 2014 through the High-Value Crops Development Program (HVCDP). DA-XI has also provided a guide for bulb onions production. It’s undeniable that DA-XI played a pivotal role in helping these farmers and associations succeed, and it is continuously providing support until now. Hopefully, more farmers and associations will not hesitate to seek assistance from the Department of Agriculture for them to be able to acquire the materials that they need for farming or the necessary facilities for processing.